Here are some ideas to help you integrate the VIP Patient Report Folder, Examination Insert, Posture Insert, Nerve Insert, Spinal Decay Insert and Recovery Insert. In the following example, the patient is presenting with headaches. The Inserts and other documents have been prepared, and two brochures (Headaches and Whiplash), along with the completed Inserts still joined together along the top, have been placed in the folder flap. After some small talk, open the VIP folder and remove all of the previously completed documents. "I've correlated the findings of your examination, and I've put it into a package that I'm going to review and send home with you, so you'll know what we found and what well be doing to help you. "In the next 10 minutes or so I'm going to review what we found, explain what these findings mean, recommend a course of action and discuss the results you can expect from chiropractic care in our office. Feel free to ask any questions as we go along." Telling the patient how long the report is going to take allows them to "pace their attention." It also prevents guilty glances at their watch. And as for encouraging questions, this helps keep your report relevant to the patient and shows that you're confident and interested in their understanding. Okay, so you've used the inside cover of the VIP Folder to introduce your report. Now, remove all the report documents behind the flap. The Examination Insert is on top. "First a quick review. You've come to our office suffering from frequent headaches, shoulder pain and occasional numbness in your right hand. As I explained, we have had excellent results with these sorts of problems. To locate the specific cause of your problem, we conducted a thorough examination. Here's what we tested." Now, with the Examination Insert positioned so you and your patient can see it, review the check marks in the "What we tested" section, explaining why or why not each particular exam was conducted and any positive findings. By the way, a quick note about positive findings. To a patient, positive findings sound, well, good. So, be careful how you refer to the test results. It might be better to say that you 'found something significant' or that the findings 'revealed such and such' rather than say there were positive findings. After reviewing both columns, refer to the other Inserts to add relevant detail. 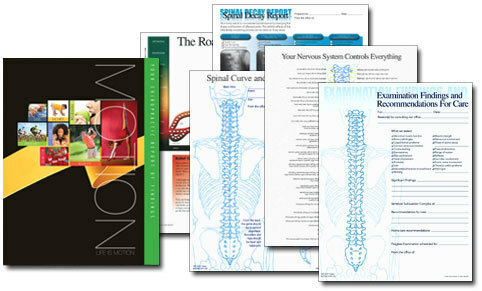 You might start with the Spinal Curve and Postural Analysis Insert. "One of the first things I noticed, and what others first notice about you, is your posture. Here's what we found." Be brief as you explain any notations you've made such as a scoliosis, loss of curve, uneven shoulders, head tilt or uneven weight distribution. Make these findings patient-relevant by mentioning the possible difficulty in getting clothes to fit right or shoes that wear out quickly. Attempt to connect your findings to the patient's presenting complaint. When you've completed your review, separate the two copies. "One for you and one for me…"
Then, you might connect the bones to the nerves with the Your Nervous System Controls Everything Insert. "This shows the back side of the spinal column and the nerves that exit from between each spinal joint to the major organs and tissues of your body. We know that when any of these moving bones lose their proper motion or position, nearby nerves are affected. We found three such areas during our examination, causing potential nerve interference, organ dysfunction and other pre-symptomatic health problems. The key thing you need to know is that we're actually more interested in the nerves than the bones. Think of the nerves as wires in an electrical circuit and the bones as the insulation to the wires. Like an electrician, we're more interested in the circuit than the insulation." Some offices like the drama of actually circling the subluxated areas in front of the patient at the report. Either way, when you're through with the process of connecting the bones to the nerves, tear off the bottom copy for your files and place the patient's copy on a stack that, later, you'll put behind the center flap of the VIP folder for him or her to take. "When you get home, I hope you'll review your copy of this document so you can see how the spine can affect your whole body. Any questions so far?" If you've taken X-rays, prepare patients to "phase place" themselves before reviewing the Spinal Decay Insert. "This comes pretty close to what we consider to be a textbook normal picture of the side view of the neck. Here's the jaw, here's the shoulder and these white areas are the bones of the spine. The dark areas between them are the discs. "And this is the same view, but it's the side view of your neck that we took yesterday. What are some of the differences you see between the textbook normal and yours?" If you're unaccustomed to using the Socratic Method with patients, you'd be more comfortable continuing your monologue and controlling the report. But there is much to be gained by helping patients truly own their problem by having them tell you what they see. You may need to coach them or ask some leading questions, but avoid the temptation to do all the work. Some patients will make it clear that they don't want to play, and if so, no problem. Once the patient can tell you what he or she sees in their X-rays compared to the normal, consult the Spinal Decay Insert. You've already put red check marks in front of the phrases that describe the patient's X-rays. "Now, when you compare the side view of your neck with one of these, Textbook Normal, Phase 1, Phase 2 or Phase 3, which one comes closest to resembling yours?" When the patient gets it right, and you'll be surprised how well patients can do this exercise, use your red pen to circle the views that best match the patient's phase of Spinal Decay. After the patient has completed the cervical view, go ahead and circle the thoracic and lumbar views if you've taken them. Some offices will add an arrow pointing to the right with the word "neglect," observing what happens if the process is allowed to continue without intervention. Review any notations or annotations you've written on the bottom "Comments" line and detach the two copies as you have with the other two-part inserts. Now it's time to return to the Examination Insert and review the "Significant Findings" notations. This is a good time to make sure the patient is attaching the same meanings to the words that you do. "Now, when I say 'nerve pressure,' what does that mean to you?" You could use just about any term or phrase. The idea is to coax out of the patient the meanings that they're attaching to terms you're using. Other terms that fall into this category include, range of motion, scoliosis, contracted leg, adjustment, even the word health. With the patient acknowledging and understanding the major findings of your examination, it's time to bring it all together on the next line, 'Vertebral Subluxation Complex at:' and there's a horizontal line. Some offices put specific segmental levels such as C5-C6, T4-T5 and L4-L5. Other offices simply put neck, upper back and lower back. It's your call. However, this is a good time to circle the problem areas on the posterior illustration on the left side of the document. The next entry is labeled, "Recommendations for Care." You'll probably want to put a short-term goal and a long-term goal. The short-term goal gives the patient hope and the long-term goal fulfills your moral obligation to alert the patient that some type of ongoing supportive-maintenance-wellness-preventive care is recommended. For our purposes, let's say you've entered, "Three visits per week for the first four weeks. Reduced visits with improvement. Monthly support care for life." "During the initial phase of your care we'll be very aggressive, seeing you three times a week. At the end of your first month of care, we'll conduct a progress examination, performing some of the same tests we did yesterday. Then, you and I will sit down just like this, compare where you were with where you are, and design a program that takes you to the next level. Usually we're able to reduce the visit frequency as the healing process unfolds. Because each visit builds on the ones before, the fastest results are achieved by keeping every visit. Now, at some point, when it appears that you've made as much progress as you're going to, we'll recommend a schedule of supportive visits, typically one or two visits a month. That's designed to help you stay well and avoid a relapse. But I'm jumping the gun. We'll talk about that when we get there." This is where some offices will refer to the Road to Recovery Insert that coordinates with the full-sized chart version. Click here for scripting ideas. "Chiropractic is a partnership to better health. There will be things I can do to help you and there are some things you can do to help yourself. If you expect me to do everything, it'll take longer. So, you have a job, and I have a job." Then review your recommendations for what they need to do. That can include everything from heat and ice to drinking more water, exercises, pillows, brisk walking, stretches, diet, supplements; anything that you recommend that can allow the patient to take an active part in their care. The last entry is enter the date of the progress examination. Some offices prefer to enter a visit number, such as, "12th visit." I prefer an actual calendar date. It assumes perfect patient compliance. It gives a day that can be flagged on the appointment book. And with the staff monitoring things, it can increase the likelihood that a progress examination will even happen! If the patient misses a visit or two, no problem, just move the date back as needed. "Any questions about what we found, the significance of what we found, and what we can do to help you?" Field any questions and then remove the bottom copy of the Examination Insert for your file and place the patient copies of all the documents you covered in their VIP folder. Turn the folder over and circle two or three of the terms most important to the patient's case. Then, present the VIP report package to the patient and complete the rest of your report visit procedures.